Practically all apps that store documents in iCloud let you delete them from the app itself, which simultaneously removes them from iCloud and thus all other synced iOS & OS X devices. But if you’re looking to manage and remove specific iCloud documents and data, there is a better way to do it through a centralized control panel within iOS that will let you view all documents stored in iCloud, much like the same feature that is on the Mac which is accessible through OS X System Preferences. Let’s focus on the mobile side of things and learn how to do this in iOS. 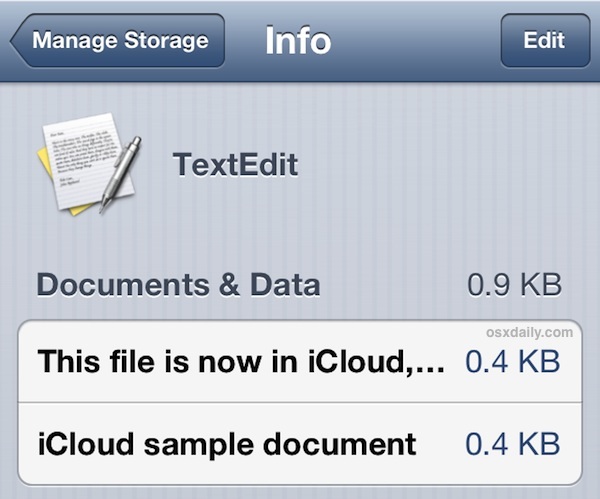 TextEdit is actually a Mac app, but it’s still visible in the iCloud document manager of iOS. We’ll get to more on the intricacies of that in a moment. Note that Documents and “App Data” are different, with the former being the files you’re used to creating and using, and the latter being preferences, settings, and save-states for things like games. 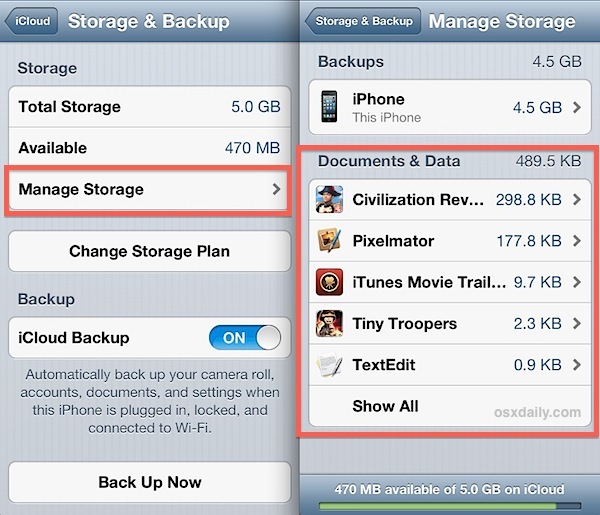 If you were to remove app data for Civilization for example, you would lose all of your saved games as well as the recall ability that keeps the game consistently where you left off, even after closing the app. TextEdit is a good demonstration that apps and documents from the Mac are visible in addition to apps and documents on any iPad, iPhone, or iPod touch, so long as they are using the same iCloud account configured on each device. Because of this, it is fairly likely you will see apps and documents that are not specifically for the device you’re using at the moment, and if you have ever used iCloud to sync documents between Macs, there will much more visible here than what is accessible through any iOS app. Nonetheless, if you delete documents from an app that isn’t on your device, it will also delete the documents from the device it was created on, meaning you can easily delete iCloud documents made on a Mac from the iPhone, and vice versa. Be aware of this when removing documents and iCloud data, since it’s possible to accidentally delete things you may not have intended to. Overall, using the centralized iCloud Manager is significantly easier than removing iCloud data manually by launching each respective app and deleting from there, and repeating until you’re finished. Most documents are fairly small, typically in the kilobytes, and won’t be much of a burden on total iCloud storage capacity, thus if you’re just trying to free up space for a cloud backup there are better ways to do that that will have a much greater impact. 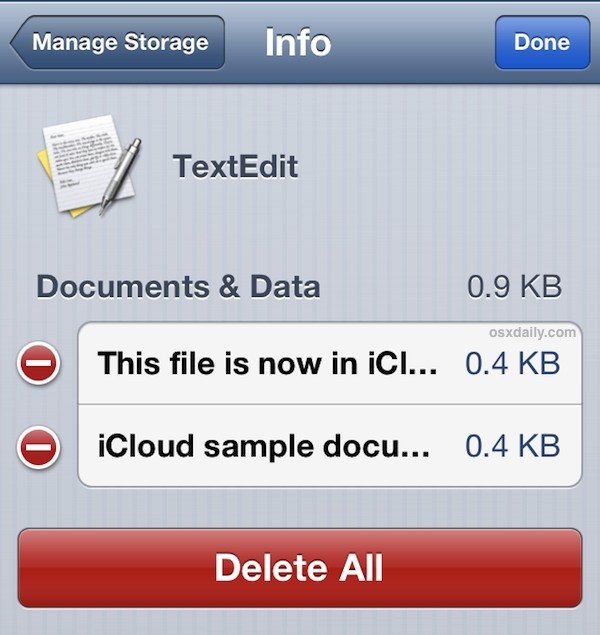 Thanks for the steps shown to manage the icloud documents. I am using iPad so was not aware of this step so it will really help me to delete the unnecessary. I see my docs in the manage storage section, but how do I actually access them for viewing and editing from my iPad??? I can’t seem to figure this out. My problem is I have 8g iPhone 4s I have run out of memory and storage but I have 200gb in iCloud and I’ve got 199gb left I went to my daughters wedding thinking it was sorted but wen I went to photograph my daughter it said not enough storage to take photo we’d????? Apple should have a big think about this Bcoz I thought getting unlimited everything would be great I down loaded an app after deleting 16 which I didn’t want to do ) but got a camera app called anoxic put them in there freed up my camera now it won’t let me take a photo coz I still got no storage inn seriously thinking of throwing it at a wall and starting again !!!!!! Judi, Constance. RIGHT THERE WITH YOU. Easy to access iCloud files that way! Path are you serious? Or just stupid? I want to delete an APP from Icloud, when I look at my documents it’s not there (facebook) I upgraded my IPhone 5 to a 6 and Icloud is remembering my password for Facebook, however on my PC I changed the password and the APP will only download from Icloud. Is there a way past this? I don’t have acces to a laptop / desktop to view what is stored in my iCloud. How do I do it from an iPhone 6 ????? It’s 4 years later and I’m still waiting for a response to Judi’s question. So frustrating. I didn’t know having an iPhone came with so much trouble.I mean how am I supposed to keep deleting my photos to create space while I have 200gbs on iCloud.why can’t there just be a solution for this full storage issue. I can’t access my iCloud, I want to delete from it. My ph says iv only used 1.3gb of 5gb. But my ph won’t back up when plugged in like it should as there’s plenty of space if I get 5gb?? Is this correct do u get 5gb free. Surely can’t be that hard to access my data . Any help appreciated ?? ?